Living in Brisbane without your own set of wheels can make getting about pretty tough. You either have to rely on that one friend who has a car or live as close to public transport as you can—both of which are easier said that done. 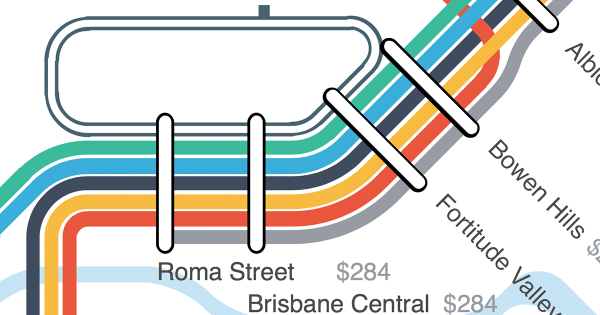 Thankfully, the team at Flatmates.com.au have made the latter easier by combining the South East Queensland rail map with average room prices within 1km—allowing sharers to see at a glance where they can afford to live. Chief executive officer of Flatmates.com.au, Thomas Clement, said the maps were made to help those looking for affordable accommodation close to transport hubs. Salisbury Station was the cheapest to rent near according to the data, with an average room rent of $145 per week. Rocklea and Moorooka Stations rounded out the cheapest three with weekly rents of $153 and $161, respectively. Overall, renting a room nearest to Brisbane’s Central Station was the most expensive averaged $284 per week, while the cheapest was Walkuraka Station with an average of just $120. Data calculated using private room listings within 1km of each train stop on the site six months prior to April 7 where that station had more than ten listings.